In certain instances, you may want to include some buffer to account for delays or external factors that affect your project. In this case, you can add lag in your project plan. Lag times can also serve as a kind of time constraint between planning elements. 1. 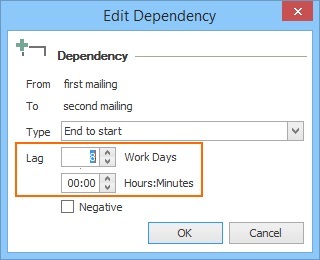 Double-click on the link that connects two planning elements to open the window Edit Dependency. 2. Add lag in work days or hours and minutes. 3. You can also add lead time. 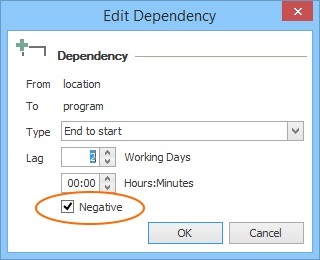 Click on Negativ when the successor can start before the predecessor is completed. Add lag to planning elements | InLoox 9 for Outlook • Copyright 1999-2019 © InLoox, Inc. All rights reserved.